From Timbuktu, Reports That Most Manuscripts Were Saved : The Two-Way It now appears that most ancient manuscripts at a library in Mali survived an attempt by Islamic radicals to destroy them. Local residents apparently removed them earlier, according to reports from Timbuktu. 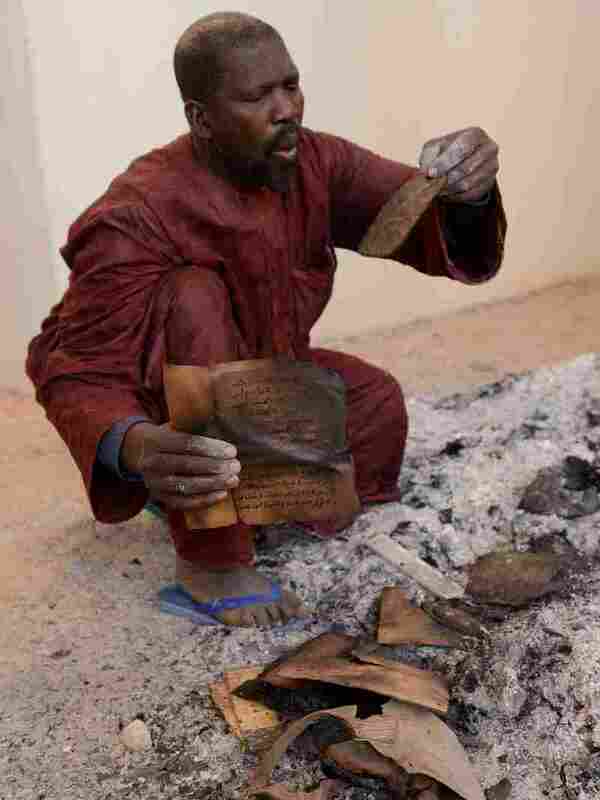 Reports from Timbuktu, Mali, on Wednesday indicate that most of the ancient manuscripts at a famed library may have been saved by residents before Islamist radicals had the chance to burn them. "I can say that the vast majority of the collections appear from our reports not to have been destroyed, damaged or harmed in any way," Shamil Jeppie, an expert on the documents who teaches at the University of Cape Town in South Africa, told Reuters. The Islamist radicals, who have been in control of many cities in northern Mali since last spring, were chased out of Timbuktu earlier this week by advancing French troops. Photographers who reached the Ahmed Baba Institute on Tuesday, found many papers burned to ashes. Timbuktu's mayor, Halle Ousmane Cisse, who has been in Mali's capital Bamako, told NPR's Ofeiba Quist-Arcton that he had been told the manuscripts held at the institute had been burned, as we reported on Tuesday. Some dated to the 13th century. Headlines around the world made it sound as if all the manuscripts kept there were gone. The latest estimates, though, suggest that about 2,000 manuscripts were torched, while the remainder of the estimated 30,000 at the institute survived. Apparently residents removed and hid many of the manuscripts, anticipating that the Islamists would try to destroy them. The manuscripts include ornately decorated Qurans and other religious texts, as well as poetry and mathematics. Many of the works date from the 14th to the 16th centuries, when Timbuktu was a major regional crossroads.